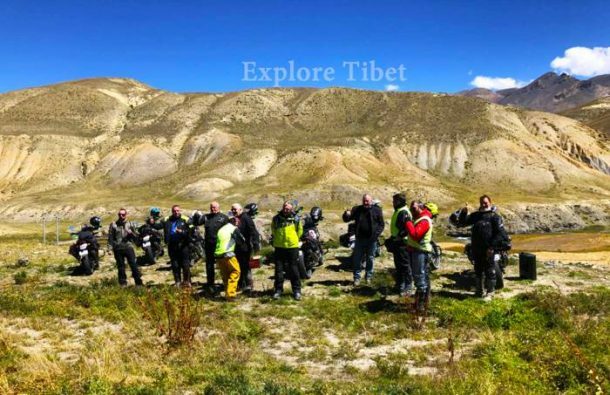 Probably the greatest experience on two wheels in the world, a trip across the vast Tibetan plateau on a motorcycle is an adventure that no right-minded biker could pass up. 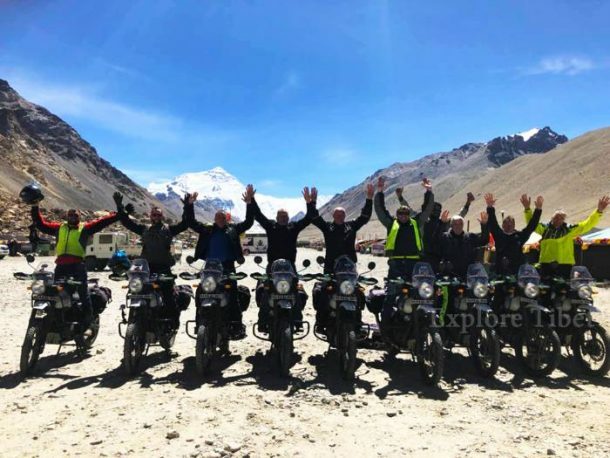 For motorbike riders, there is nothing that could equal the experience of riding your bike from Lhasa to Kathmandu, crossing the vast arid plains and high-altitude passes of the Tibetan plateau and the Himalayas. Taking a normal tour in a car is one experience, while cycling across the plateau is another. However, taking a bike along the open roads of Tibet is the perfect combination of the two, and is likely to be the biggest adventure of your life. Since there is nothing that beats that feeling of riding free on the open road with the wind in your face, this trip across the roof of the world is the ultimate in riding experiences. One can see changes in culture, landscape and people from Lhasa to Kathmandu. From Lhasa, the journey starts by heading west along the G318 and the S307 towards Gyantse, which is normally the first stop on the journey across the plateau, 263 kilometers from Lhasa. Passing close by Lake Yamdrok (4,441 m), Gyantse is the home of the stunning Gyantse Kumbum and sits at an altitude of around 4,000 meters above sea level. The road from Lhasa to Gyantse is average, for a paved road, with no gravel or dirt stretches. From Gyantse, the next stop is Shigatse (3,800 m), where you rejoin the G318 Friendship Highway. A trip of just 94 kilometers, this shorter day gives you a little chance to rest from the long ride the day before. The road is well paved from Gyantse to Shigatse, and the short distance means that you will be ready for the next day’s ride. Then it is out of Shigatse, to visit the most famous mountain in the world, Mount Everest. Mount Everest lies around 340 kilometers from Shigatse by road, though the direct distance is much less. There is also an increase of around 1,400 meters between Shigatse and Everest Base Camp (EBC). The route takes you over some of Tibet’s highest passes through the Himalayan mountains, such as the Gyatso La Pass at 4,528 meters and the Gawu La Pass at 5,198 meters. The paved road ends at Rongbuk Monastery, a few kilometers from the base camp itself, and the last part of the ride to EBC is over dirt roads. This is the part where you can trek to the base camp and enjoy the thrilling views as the mountain gets closer. After a night at Rongbuk guesthouse, the route takes you back along the same road towards the G318 once more. Once you hit the Friendship Highway, it is a ride of 237 kilometers to the next stop, at Gyirong Town. The route takes you off the Friendship Highway once again, as the road to the border crossing into Nepal no longer follows the route of the G318 to Zhangmu. With the border crossing moved to Gyirong Port, to the northwest of Zhangmu/Kodari due to the earthquake in 2015, it has made the trip a little longer than before. Bikers taking a break on the way from Lhasa to Kathmandu. Around 120 kilometers after you rejoin the Friendship Highway from EBC, you will leave it again to take the S214 Provincial Road to Gyirong Town, a distance of around 117 kilometers. Gyirong Town is a lot lower in altitude than EBC, so you should not need to worry about altitude sickness too much from this point on. At just 2,700 meters, you are already descending towards the Nepal border. While the road to the border is paved, it is not in the best condition, mainly due to the trucks that now use this route to get into and out of Nepal overland. However, it is not so rough that it is dangerous, and can be ridden on easily. The route to Gyirong Port from the town takes around 40 minutes, and that is where the good roads end. Once you have crossed the border into Nepal, the road from Rasuwa Gadhi on the Nepali side of the border is mostly gravel and dirt roads all the way to Bidur, where it does get a little better for the trip into Kathmandu. While the route may be long, there are plenty of things to see along the way, and plenty of time to see them. The first sight along the road is the stunning expanse of water known as Lake Yamdrok. One of the Great Three Holy Lakes of Tibet, Lake Yamdrok is a spectacular sight, which first comes into view as you crest the Gampala Pass. Below you, the lake stretches out for what looks like forever, and as you come down to its shore, the glinting sun shines brightly on the turquoise waters of the holy lake. Not far from Lake Yamdrok, there is another site for you to stop and see; the Karola Glacier. A pristine white hanging glacier on the side of the mountain, it lies close to the road, and you can stop there to view this stunning sight. From the glacier, it is then on up to the Simila Mountain Pass, where prayer flags hang fluttering in the breeze and sending their wishes of good fortune out across the Tibetan plateau, and the rest of the world. Gyantse is a place of amazement, with its spectacular Kumbum, a 32-meter-tall stupa with 108 chapels over nine levels. 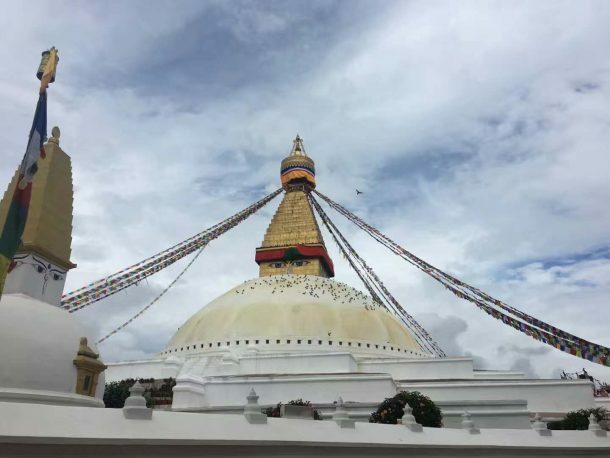 The largest stupa of its kind in the world, it is more of Nepali design than Tibetan and is one of the most awesome sights in the region. The stupa lies inside the Pelkor Chode Monastery, the only monastery in Tibet to house three different schools of Tibetan Buddhism. In Shigatse, the main sight is the Tashilhunpo Monastery, founded in 1447 by a disciple of the Buddhist guru, Je Tsongkhapa, who later became the first Dalai Lama. The monastery is the traditional seat of the second highest reincarnation in Tibet, the Panchen Lama. Outside Shigatse, the biggest sight of the tour looms high above you, standing 8,848 meters above sea level. Mount Everest, the world’s highest mountain, is the main reason many people come to Tibet, and the views from EBC are spectacular. 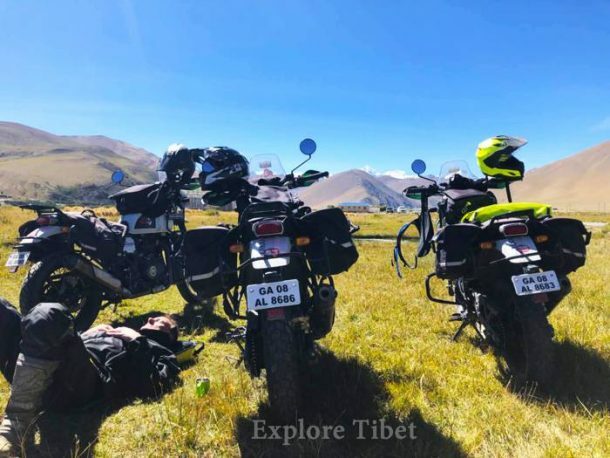 While it is possible to travel to Tibet at almost any time of the year (with the exception of February and March), there are certain times when touring on a motorcycle can be a little dangerous or a little uncomfortable. Winter, while not being as cold as many people think, is still too cold and dangerous for traveling to Nepal across the higher passes that lies closer to the border regions and Mount Everest. Similarly, summer may not be the best time to ride the plateau roads, like the rain, despite there not being much, can make things a little less comfortable than you might like. The best times to travel on a bike across Tibet have to be in the spring and autumn, from Late April to early June and from the start of October to the middle of November. At these times, the weather is clear and bright, there is almost no rain at all, and the temperatures are still warm enough for the trip to be really enjoyable. If you are willing to do Tibet motorcycle tours from Lhasa to Kathmandu or Kathmandu to Lhasa, you can contact us at sales@exploretibet.com. We can design and arrange a suitable tour base on your demands. Hi, do you organise tours including bike hire from Lhasa to Kathmandu, if so over how many days and what is the cost approximate cost? It would be for a single traveller.